Pull into a boat ramp on Arkansas’s Bayou Meto Wildlife Management Area three hours before legal shooting light and you’ll be greeted by a line of trucks hundreds of yards long. When the mallards are migrating, it seems like everyone with a sack of decoys and a duck call wants in on the action. If you believe even a fraction of what you read, those hunters are the last vestiges of a dying endeavor, the remnants of a once-thriving culture that is fading into obscurity. Anti-hunting groups celebrate “the death of hunting,” and even hunters fret about the looming demise of the sport. Hunting, we are told, is on life support. But don’t tell the thousands of duck hunters who flock to Arkansas’s green timber public hunting areas like Bayou Meto every winter. The morning barrage of shotguns can sound like the grand finale of a Fourth of July fireworks celebration. It’s a wonder any duck makes it out of there alive. It’s not just world-famous duck hunting on public land that remains in high demand. Try drawing a limited-entry big-game tag in Wyoming, Montana, or Utah. More than 40,000 hunters applied for 28 bighorn sheep tags in Colorado this year, and 186,000 applied for a deer tag. Nearly 80,000 applied for one of 710 Kentucky elk tags, and more than 900,000 people bought hunting licenses in Pennsylvania. There’s no question the sport is facing some significant challenges. The number of hunters slipped from 18 million in 1982 to fewer than 12 million in 2016, according to a survey by the U.S. Fish and Wildlife Service (USFWS). Small-game hunters fell by a whopping 39 percent between 2011 and 2016. The average age continues to inch upward, as well. Sixty percent of all hunters are over 45. Does that mean hunting has one foot in the grave? Hardly. To paraphrase Mark Twain, reports of hunting’s death have been greatly exaggerated. The USFWS survey doesn’t tell the entire story, said Mark Damian Duda, Responsive Management executive director. Based on his research, as many as 30 million Americans identify as hunters. They may buy a license only every three or four years, but they consider themselves as both hunters and part of the hunting culture. In other words, downward trends in hunting participation are in part a result of basic supply and demand. That’s inevitable. The U.S. population has grown by nearly 100 million people in the last 40 years, and an additional 88 million people will live in the United States by 2060. Many of them are choosing not to live in cities, but in exurbs, developed areas within commuting distance of cities. Those bedroom communities used to be hunted farmland. The good news is that sprawl likely will never reach deep into the nooks and crannies of rural America. Places like the Corn Belt, the Deep South, the North Woods and even the rural Midwest will always have huntable land. And despite a shrinking population of rural white males—the traditional backbone of America’s hunting culture—that land will continue to be hunted, Duda said. Duda also thinks the sport will continue to undergo demographic shifts that are already taking place. As a group, hunters are becoming more suburban, probably wealthier, and likely more dedicated. Some hunters fear the shift of income-related demographics will lead to the “Europization” of American hunting—that is, only the affluent will have access to private land. Devney doesn’t buy that. He points to the North American Model of Wildlife Conservation, which is recognized by every state and federal agency that oversees wildlife management. The model affirms seven tenets, including that wildlife is held in public trust, laws are necessary to protect wildlife, and hunting is governed through democracy. Everyone is granted the opportunity. The federal government alone owns more than 600 million acres. Most is open to hunting. State-owned land and various private-property lease programs add millions more acres of opportunity. For example, Montana’s Block Management Program opens 7.3 million acres of private land to public hunting. The problem is that the increase in available public land isn’t keeping pace with the loss of huntable private land. State wildlife agencies simply don’t have the means to buy more land, which is why Holsman believes funding at the federal level is more important than ever. Help may be on the way. A number of bills that address conservation funding have been introduced in Congress, including the Recovering America’s Wildlife Act. It has strong bipartisan support and would provide at least $1 billion annually to state wildlife agencies. The money would come from existing royalties on energy extraction on federal land and would allow states to fund wildlife action plans. Bipartisan efforts to permanently reauthorize the Land and Water Conservation Fund (LWCF) also have gained traction in Congress. The LWCF uses offshore energy royalties to pay for everything from city parks to new public land. Money from the fund recently purchased 600 acres in Arizona that created permanent access to 36,000 acres of federal wilderness. At the same time, efforts to boost hunter recruitment, retention, and reengagement are at “an unprecedented level,” Holsman said. 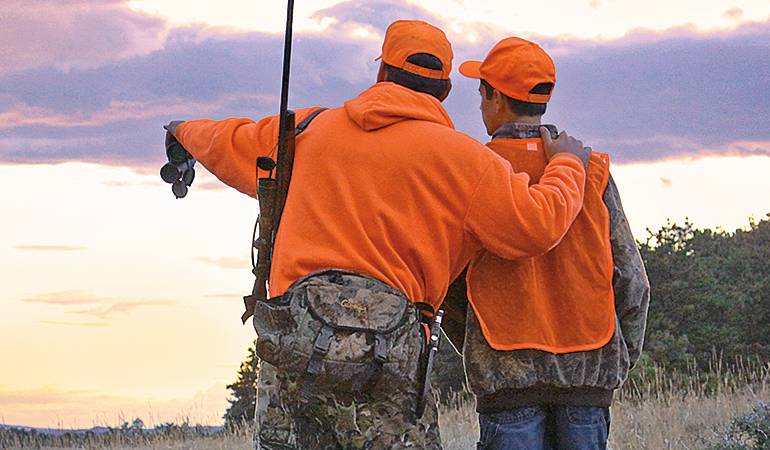 Instead of targeting children, these new R3 efforts are directed at young adults and adult suburbanites who have an interest in hunting but who may not know how to get started. We won’t ever return to the level of participation we saw in the 1960s through the ’80s, but Devney is convinced hunting will remain a vital part of our culture.